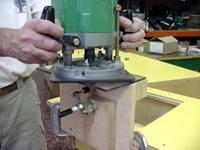 Rather than using a dowelling tool, we built this jig and used a hand held router to make the 1/4" diameter holes. It's made from scrap wood and a piece of clear lexan. 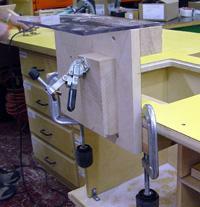 The jig was built to clamp onto a router table or work bench. Screw the plywood to the pine as shown. 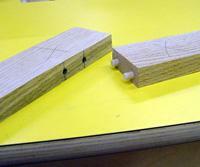 We used a 7/16" diameter guide with a 1/4" spiral bit in a portable router to cut the dowel holes. Drill two holes 7/16" and 1 1/8" center-to-center in the lexan. Mount the lexan so the center of the hole is 3/8" from the edge of the plywood. Our project material is 2" wide and 3/4" thick. 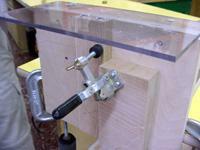 Attach the 3" x 5" x 1 1/4" pine to the plywood so that the 2" wide project material is centered on the two dowel holes in the vertical position. 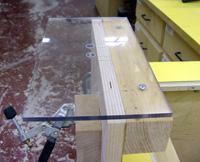 This pine material must be at least 2" from the underside of the lexan to hold the stock in the horizontal position. Mark the face side of your stock. 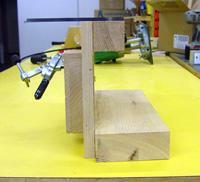 When clamping in position keep the marked side against the plywood. 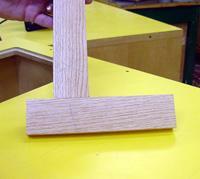 Mark the center line of the holes on the horizontal material and clamp into position. 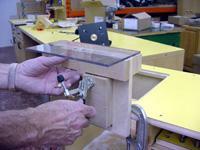 Set the depth of cut and drill the two holes, slide the material to the next location and repeat. Next slide the vertical piece into position and drill the two holes in both ends. 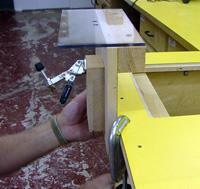 Glue, insert dowels and clamp until set.